These construction road signs were all hacked with a computer by apparently the same bloke near the University of Texas, Austin, Texas early morning on the 28th January 2009. Well if you saw this sign would you be surprised? I’m not. 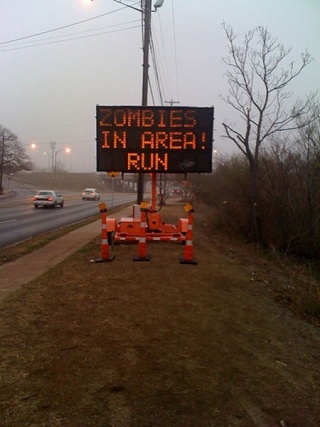 Zombies are always on an apocalyptic rampage for fresh meat, and I’m glad the city of Austin (officially responsible for the signs) felt it was important to warn the citizens of an imminent zombie attack. Besides if you post an article about how to hack something, people are going to do it. Simple as that. I have now officially closed my myspace blog account. It has been running secondary to this one since I opened my blogger account at the end of last year and now it has seen its last legs, it just had to go! A selection of old blog posts have been transferred to Sunshine Musings if you fancy a bit of a read in the archives, Sophie Lancester and April Fool 2008 are some good ones : ) There seems to be a lot of personal stuff recently and not enough politics (it comes from being a cooped up housewife) so I'll try to find some more interesting news to give my opinion on in the future. There has been a big ruckus recently over the mother of octuplets born in California a few weeks ago. The congratulations and joy at such an interesting birth and exciting healthy new family turned to discord in the newspapers on TV and radio. The mystery mum Nadya Suleman, 33, already has 6 children, 3 of whom are disabled. She had them all though IVF with a male friend who donated sperm for all 14 children. There have been quotes from her own mother who cared for the 6 older children the past 4 months who is apparently out raged that Nadya - heavily pregnant- has not been able to care for them. Fair enough when you are struggling, but moan to the media? This woman needs all the help she can get, especially support from her own family. Doctors are slating the IVF specialist Michael Kamrava -whose clinic has appalling records btw- for attempting so many embryos at once. Even someone who I greatly respect said, “She probably can’t provide for them” when the first news was posted about her. As it turns out she is a single mother and out of work ...looking after 6 children is a full time job, especially with children who are disabled and need additional care. Look further than the news and you can see the story. Who can judge if this woman is a fit mother or not? Having a lot of children is not a judge of parenthood, whether good or bad. And as for the disrespect I have read and heard about her marital status, it is absurd. Who says a single woman can or can not be a great mother? (Although I don’t doubt with 14, an extra pair of hands would be a great help) The same people who say a single woman can’t adopt or have IVF, those who say gay men and women can’t either. I think they are all wrong. Anyone can be a great parent; you cannot judge it by their bank balance, their creed or sexuality. It is by their commitment, security and their love that you judge a parent. The old women in a shoe? She had no money but I bet she loved every one of those kids. Another example is the large catholic families in Ireland, they often were short on pennies but had dozens of children, no one is judging them and nor should they. I’m not saying I agree with Nadya’s decision to have so many children, but I do respect it. Think of those who have children by many fathers that are unplanned, this woman planned her family and made a conscious effort to make those plans to come to life, literally. If she can afford IVF and survives on the handouts that US government give her (pitiful compared to our British benefits system) she must be able to provide for her family. Of course with IVF the success is not always high and having 6 embryos implanted this time round was great risk to both her body and her heart, it is not guaranteed any of the babies would make it, (after all the uterus is only made for one baby at a time) but it paid of and the gamble resulted in 8 new babies. A few more (6 or 7!) than expected but gratefully received none the less. I say good luck to her and I look forward to following the story in future.